Strength says LOVE is the source of your strength – the “energy” of your unconscious “tamed” and released by the direction of your conscious understanding – harnessing your natural energy so that you work in harmony with it. Your “inner” qualities represent love, patience and gentleness – they are always superior to the material powers of force and hate, for they provide you with the “inner” strength to confront yourself calmly and without fear. Choose to use the love you feel within – believe that the process of self-discovery is a joyous one. Control your own emotions – look directly at any obstacle and see if it is real. Strength is “total” living – living with the undiluted multiplicity of your being. Combining your capacity to destroy with your power to regenerate and heal. Taming your powers and drives by finding the “inner” power that gives you your strength. Affirm all your individual qualities – be sensitive to what you are feeling every moment. Wanting to control your life – your “ego” conscious suppresses your feelings, fears and desires which creates confusion. In order to realize satisfaction and joy – success requires organization. Your “inner” strength allows your passions to emerge – releasing your deepest emotions with love and faith, for this is the first step in going beyond the “ego” and opening up your personality with a sense of peace, love of life itself and a great confidence in the final result. It requires a great deal of courage as well as strength – for you must control and direct the energy rather than allowing it to take you wherever it wants to go. Free yourself from the forces of repression – “doubt” reduces thought to indecision and it appears when the Higher Self and the physical “ego” self are not in balance. “Certainty” allows you to doubt “within limits” while still maintaining faith in the expected outcome. You will begin to understand others if you will take the time to imagine yourself in their place. You have the ability to face life – particularly this difficult problem or change – with hope and eagerness. You are strong within – allow yourself to experience life passionately, yet peacefully – without being controlled or carried away by your passions. Joy as you feel the “inner” strength to begin this new project or continue a difficult project – despite your fear and emotional strain. Find the place where you can make a statement and get your idea across – leave a lasting impression. Your subconscious mind controls your body and its functions – you receive, then act upon the suggestions sent from your conscious mind. Choose to cultivate your desires and you set up a chain reaction which will eventually produce tangible results. Power, strength, discipline, intelligence, justice, karma, respect and unity are all possible when you act powerfully, but with a sense of “inner” calm. Your “inner” resources will always overcome any adversity as the love in your heart unites with your spirit, heart and body and produces harmonious action. New – Here is the eighth stop. Properly channeled and controlled emotions. You are on solid ground, centered. Strong self-image and self-respect. Confidence. There are extensions of self in place and functioning, i.e. family/extended family and creative projects. A feeling of invincibility. An emotional sense of the eternal, of permanence, Loyalty, Constancy without stagnation. A harnessing of our lower energies to support/generate higher energies. Here is the source of courage, the assumption of responsibility for one’s own existence, hence emotional independence. The feeling of duality is strong but the self is in harmony with all extensions of the self, and with nature. Your heart has begun to know things for itself, with the help, but independent, of mind. (The hypothalamus is that aspect of mind, of reason, belonging to the heart.) Here ideas are generated in the gut, the Solar Plexus, before reason and perspective of higher mind get a crack at them. Conversely however, it is proper to say that this is the effect of mind in the emotions. We see here that true strength lies in our hearts, in our emotional stability. How strong is your love? How are you being called upon to show courage and perseverance? What do you desire to create? What inner passion needs to be expressed? What inner passion needs to be reconciled? What is the “natural” or instinctive thing to do? In the first position: Your emotional ties are very important. This lifetime may be centered on or within your origins, family, heritage. Your personal and group karma are closely related. Your abilities with people, the social graces, manners figure prominently in this lifetime. In the second position: Your social prowess, your credits with people, facilitate your getting what you need. Thus far, your personality has been your greatest asset. There is a constancy in your affairs that stands you well. In the third position: Your strength now must come from and go into existing relationships and creative enterprises. Use your social gifts to the maximum. In the fourth position: The desire here is to be strong and capable whenever and wherever one might need to be, for oneself and for others. From this derives your easy way with people, one on one and in groups. In the fifth position: You should be consciously dealing with your emotional systems, the effectiveness of all your relationships and your creative thrust. Here is analysis of therapies. In the sixth position: The near future will find you centered and strong within your relationships and your creative processes. The balance between self and other, between humanity and nature is healthy. In the seventh position: Exploration of the depths and loyalties of relationships, of the rightness of your creative interests. Are you as strong as you could be, as you want to be? Here is the exercise of both losing and finding yourself in your relationships with others, with your group, and in the immersion in your talents. 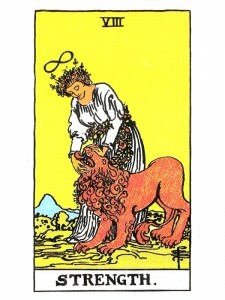 In the eighth position: You are in the right place at the right time and can deal from a position of strength. You are surrounded by what you need and yet you are free to move as the need arises. This is a healthy balance between attachment and non-attachment in the Physical/material Plane. In the ninth position: There is a good sense of belonging as your heart is centered in a very healthy emotional world, immersed in relationships that are productive and rewarding. As a result you are highly energetic and motivated. In the tenth position: Here is the grace of emotional calm, a taming and focusing of energies in relationships or in creative matters. You will be more confident in social situations as you will be armed with emotional extensions to back you up. Failure is irrelevant, if not out of the question. You have nothing to lose.